I actually can't believe I'm about to type these words... I have done some baking! It's been such a long time since I've baked something that it feels so freaking good to finally put a new recipe up for you all. As you might know, I moved back in with my mum a few months ago and all my baking stuff is sitting in boxes at my grandad's house, so baking has been completely off the cards - until recently! It was Mother's Day here in the UK on March 31st and the tradition in our house is that everyone else does the Sunday dinner while my mum puts her feet up. Obviously, the pudding portion is given to my sister and I, but this year my mum had requested profiteroles (even though she said she was kidding when I barrelled into the kitchen all ready to make some choux, but we'll let that slide). I'd only ever made profiteroles once before, but you know me, I'm not one to shy away from a challenge that easily. It's also worth me saying at this point that I had zero intention of my profiteroles looking like the photo above. They were going to be sleek and sophisticated, but my eldest goddaughter, who loves helping in the kitchen, ended up coming to give me a hand and things got a little bit messy. 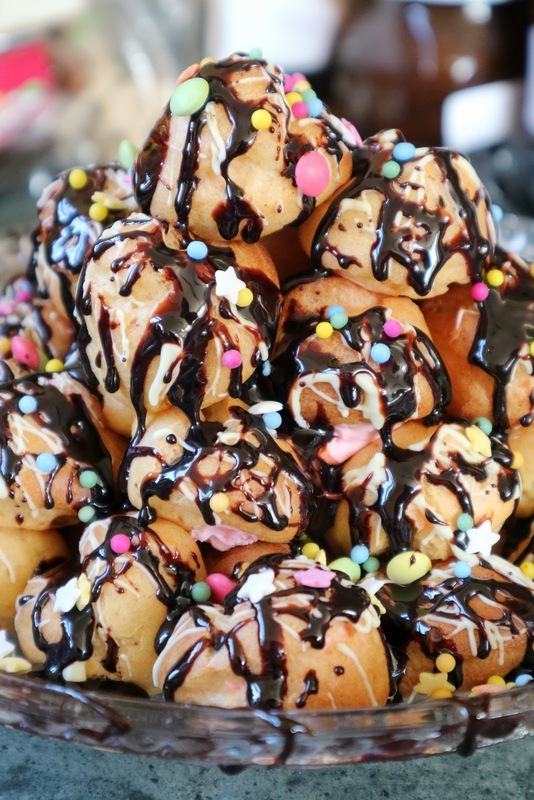 Profiteroles are made from choux pastry, which is notoriously difficult to make, so I was a little bit apprehensive and made sure to do tons of research before I put a plan together. Like I said, I've made profiteroles before and they worked out really well, but I was worried that I'd become a bit rusty after being out of the baking game for so long. 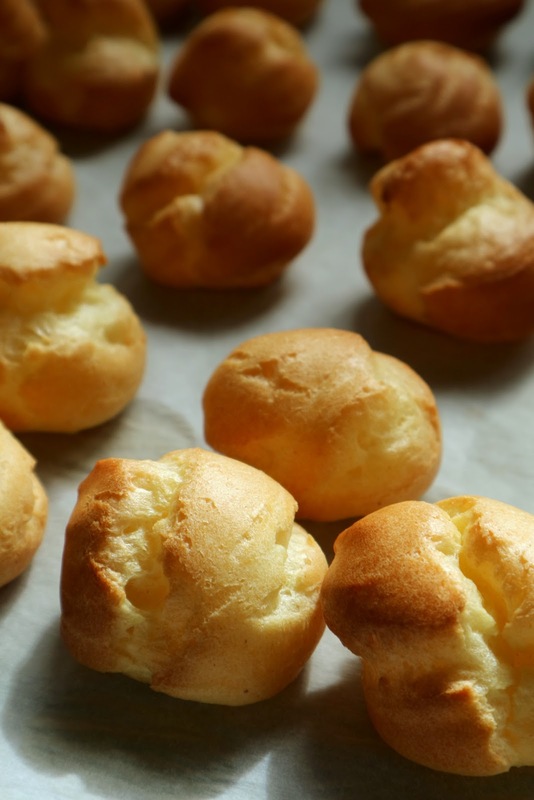 Now, there's an extensive list of things that can go wrong with choux. It can deflate, not rise when baking, become cracked, stay doughy... the list really does go on! 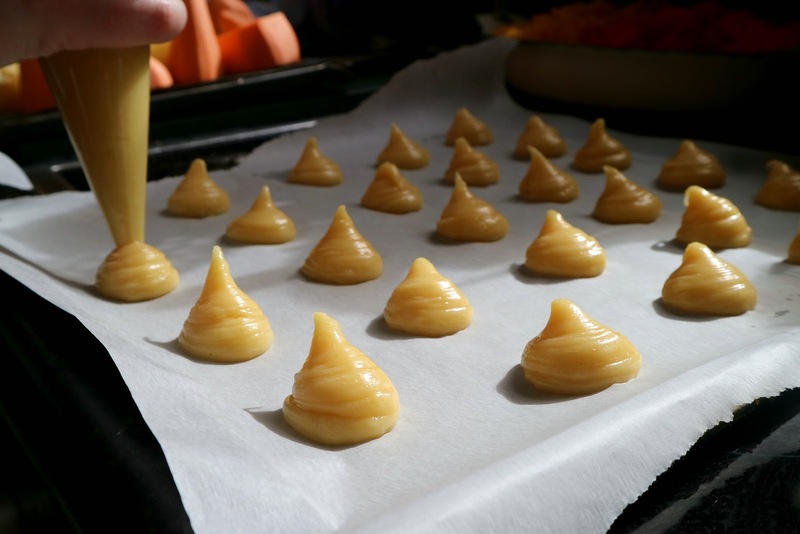 But there are plenty of ways that you can avoid such disasters - in fact, I've found this really helpful article all about choux and some trouble choux-ting tips (dya see what I did there?). However, you shouldn't let this put you off! After all, the only way to get better at something is to practise. I'm pleased to say that my choux worked pretty well. I'll admit, some were a little overdone, but they were light, filled with air pockets and were a great size for stacking up. I'll hold my hands up and say that some of the second batch did deflate a tiny bit, but it wasn't anything that couldn't be saved with a pipe of my whipped cream filling. Speaking of my whipped cream filling (oo-er! ), I wanted to make these profiteroles slightly more interesting, so I added a little bit of pink gel food colouring into the cream before I whipped it up. This turned it the most fun shade of strawberry milkshake pink, so much so that I was half tempted to add some strawberry flavour in too. It was odd having a taste and it not tasting like strawberries! But this was a really quick and easy way to turn traditional profiteroles into something a little more exciting. And of course, you could colour the cream in any shade you like, but always use gel food colouring for the highest colour payoff. 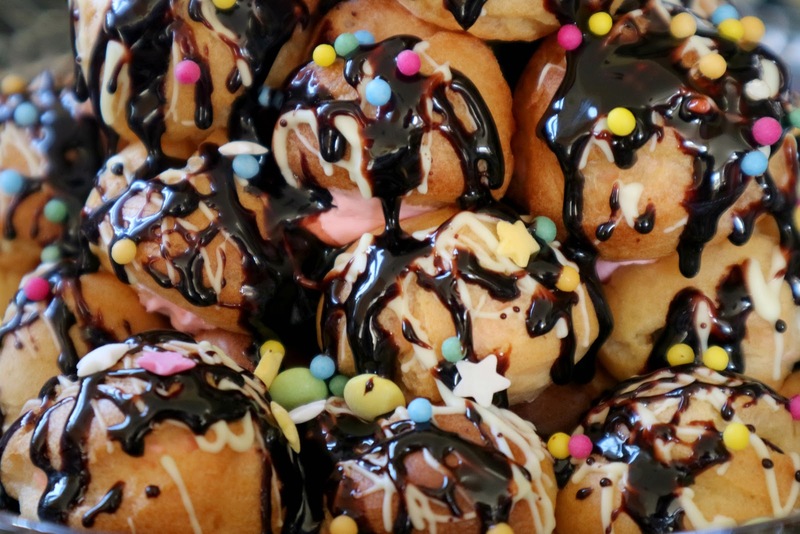 So, I had planned to decorate my profiteroles in a traditional way - a dip in chocolate ganache and stacked up - but then the white chocolate came out, a chocolate sauce was made and sprinkles were thrown about. While this isn't how I had planned for them to look, it was lovely to see how proud my goddaughter was of her 'helpfulness', so even though these profiteroles aren't Pin-worthy, they're definitely worth a blog post. Preheat your oven to 220C/200C/gas mark 7. To make the choux pastry, put the butter and caster sugar in a saucepan with 150ml of water. Place the pan over a low heat until the butter and sugar have melted, then bring to the boil. Take off the heat, then add the flour and salt all at once, beating quickly with a wooden spoon until the dough comes away from the sides of the pan. Leave the dough to cool for 5 minutes, then beat in the eggs bit by bit in a food processor or with an electric whisk until you have a stiff, glossy dough. Lightly grease and line one or two baking sheets with greaseproof paper, then spoon your dough into a piping bag with a large round nozzle attached or the end snipped off. Pipe blobs of dough on to the paper - if you want medium-sized ones like mine, I'd say the blobs needs to be slightly bigger than a 50p piece, but go as big as you like! Use your finger to dab the tops with a little bit of water, then pop them into the oven for 18-20 minutes until risen and brown. Once baked, remove your profiteroles from to oven and allow them to cool slightly, before poking a hole in the bottom of each one to allow the hot air to escape. This will help to reduce any collapsing. In a medium bowl, pour out your double cream, and add the splash of vanilla and your food colouring. Use an electric whisk to whizz these together until it just holds its shape. 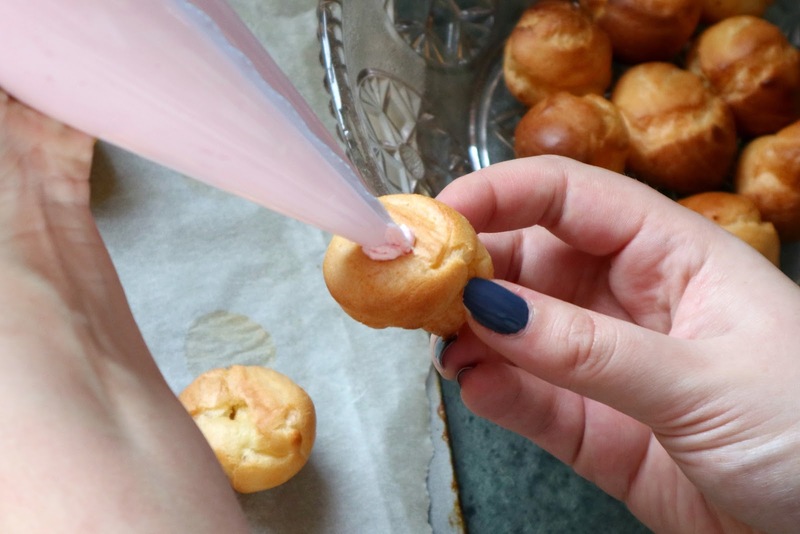 Then, once your profiteroles are cool, pop the cream into a piping bag with a thin nozzle on the end and fill each profiterole with cream by piping it through the air hole you made. Melt your white chocolate in a heatproof bowl over a pan of barely simmering water, stirring to avoid burning. Once melted, set to one side to cool slightly. Start making your chocolate sauce by soft the cocoa powder into a bowl. Put the sugar in a pan with 100ml of water and warm it over a low heat until dissolved. Bring to the boil, cook for 1 minute, then pour the syrup over the cocoa powder, mixing until smooth. Return the sauce to the pan, cook for another minute, then set aside for 15 minutes to cool. Stack your profiteroles on a plate in any way that you like, then drizzle over your white chocolate. Add spoonfuls of your cooled chocolate sauce, then add sprinkles for even more fun. And voila! This stack of crazy, unicorn profiteroles was born! I told you they were a bit messy, but hey, they tasted bloomin' lovely. Like I said, Niamh was so chuffed with her little self, and I was quite proud of all that were involved too! We did a pretty great job, so I feel a lot more confident now about doing choux pastry. Who knows, the next recipe I do could be chocolate eclairs! But if you take one thing away from this post it should be to try new things and to not be afraid to fail because that's how you learn.